Ah, yes, it’s almost Winter Warm-Up time now — autograph tickets go on sale this Monday, Jan. 6, at 9 a.m. Central Time. I’ll admit I love seeing the pricing for the autograph tickets when they go on sale each year — whose is the most expensive (no surprise that it’s Yadi, at $100), whose seems ridiculously low ($5 for Pete Kozma and Shane Robinson) and what the prices are for new guys (Jhonny Peralta’s is $25, Peter Bourjos is $20 and Mark Ellis is in the previous category at $5). I also am extremely curious as to who decides on these prices and how — particularly when it comes to the new guys. How is it determined an autograph from Peralta should be the same fee as that of Shelby Miller? And how is Trevor Rosenthal’s more than Shelby’s, at $35? 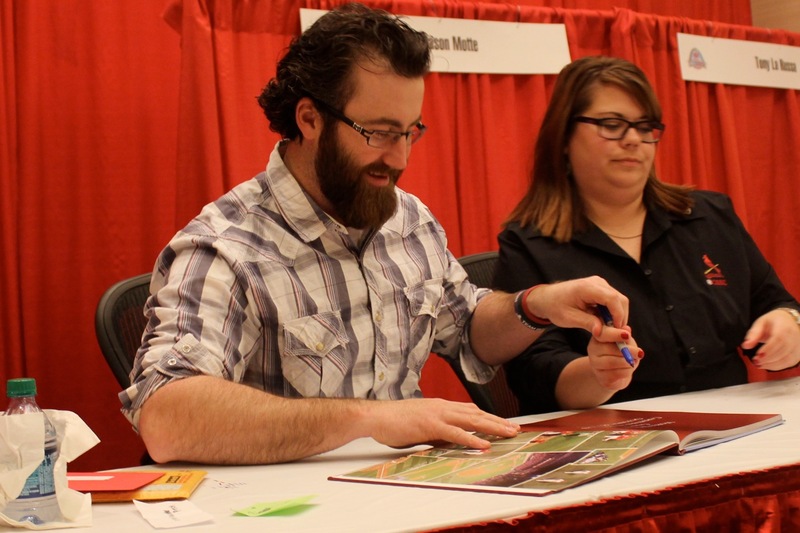 Also, since he’s pictured above, Jason Motte’s is $30 (and the complete list is below). Player autograph sessions are one of the most popular attractions of the Warm-Up. While some players’ autographs are free with the admission pass, others require an autograph ticket available through a specific additional donation. Every dollar donated for autograph tickets – as well as all proceeds from the Winter Warm-Up weekend – benefit Cardinals Care, the team’s community foundation that cares for kids. The highly-anticipated annual event takes place Saturday, Jan. 18, through Monday, Jan. 20 (Dr. Martin Luther King Jr. Day), at the Hyatt Regency St. Louis at the Arch. Fans may continue to purchase admission passes for the three-day Winter Warm-Up online at cardinals.com/winterwarmup, in the official Cardinals Team Store at Busch Stadium and at Cardinals Clubhouse stores located around St. Louis. A Winter Warm-Up admission pass is required to enter the Warm-Up and obtain autographs. Fans will have the opportunity to meet members of the 2013 National League Champion St. Louis Cardinals including Adam Wainwright, Matt Carpenter, Allen Craig, Matt Holliday, manager Mike Matheny, NLCS MVP Michael Wacha and more. Hall of Famers Red Schoendienst, Whitey Herzog and Tony La Russa will be on hand for the weekend event as well as two of the newest Cardinals, outfielder Peter Bourjos and shortstop Jhonny Peralta. Fans are encouraged to visit cardinals.com/winterwarmup for the most up-to-date details about player autograph dates, times and, if required, additional donation amounts. All autograph tickets will be sold online through Wednesday, Jan. 15, at 5 p.m. Central Time. Any remaining autograph tickets not sold online will be available at the Winter Warm-Up. For complete event details, schedule and frequently asked questions, visitcardinals.com/winterwarmup. The current autograph schedule follows below. Cardinals Care was established to give fans a way of teaming up with Cardinals players and the Cardinals organization to help children in our community – both on and off the baseball field. Since it was established in 1997, Cardinals Care has invested $19 million in helping children, including providing $11 million in grants to over 800 non-profit youth organizations, and building 21 youth ball fields in neighborhoods in both Missouri and Illinois. In 2013, Cardinals Care celebrated the 10th anniversary of the innovative Redbird Rookies program, a free baseball league for kids who otherwise might not have the opportunity to play. In addition to providing all the uniforms, gloves, bats, balls and other equipment needed for each team, Redbird Rookies also provides extensive off-field support in the areas of health, education, mentoring and the cultural arts for each of the nearly 4,500 kids who participate in the program each year. The following players will be signing free autographs and will require a line ticket. More information will be available at the Winter Warm-Up. Check cardinals.com/winterwarmup for their dates and times. This entry was posted in General Cardinals and tagged press releases, Winter Warm-Up by Christine Coleman. Bookmark the permalink.